Winners of 2013 Good Sam Syracuse Rally Dream Vacation! 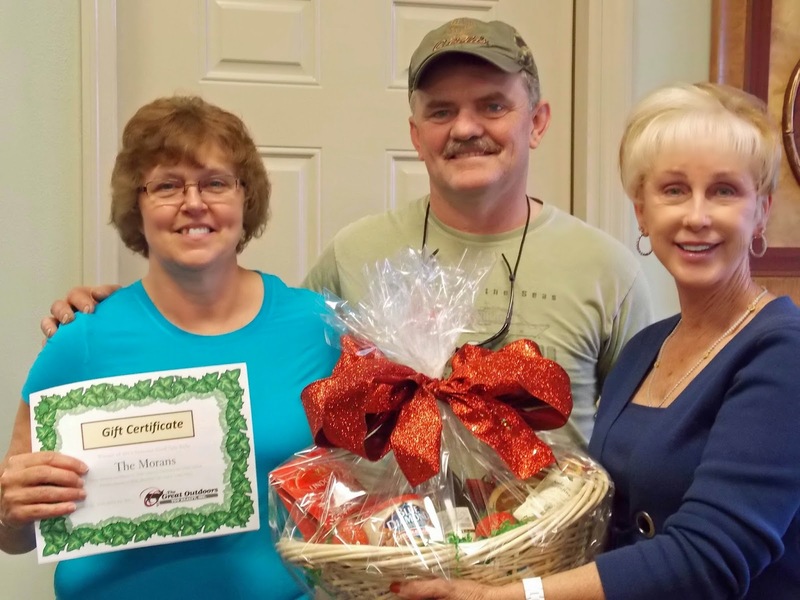 Judy Willeke of TGO Realty welcomes Rick and Pamela Moran from Nunda, New York to The Great Outdoors!. They entered our Dream Vacation Contest by stopping by our booth at the 2013 Good Sam Rally in Syracuse, New York and filling out an entry form. They received a week's stay on a full hook up site, dinner for two at our new Blue Heron Restaurant, round of golf for two on our 18-hole championship course, and use of a golf cart during their stay - not to mention a beautiful welcome basket of wine and goodies! Pamela said, "We never win anything!" and were surprised to receive the call that they had won! Just goes to show you - be sure to stop and visit us at our booth - we will keep you posted on our next trade show appearance!